Some of you are ready to begin sending your Thank you letters to your businesses. Thank you letters are worth 2 points, and a correctly addressed envelope is worth 1 point. Business envelopes are located in the cabinet by my desk (4th shelf on the right, located on the left side under notebook paper). I've created a cheat sheet to help you complete your Thank you letters. You will need to download the letter. Make sure you save your letters to Canvas. Remember that you will lose your work at midnight if you save anything to your desktop. Student computers are wiped nightly. I don't want anyone to lose any work. All hyperlinks work- just click on the letter you wish to use. Please see me if you have any questions. Production is currently in full swing! Our first deadline is fast approaching. Please let me know if you are struggling to meet deadline. Once you feel comfortable with your page, you must allow Matthew and Kaitlyn to look over your page prior to placing it in proof. Please remember that you will hear constructive criticism regarding your pages. Our skills will not improve if we do not collaborate, share ideas, and learn from one another. Your goal is to provide the best coverage possible in our book, while making sure we adhere to our verbal and visual theme. Once Matthew and Kaitlyn have approved your page, you may place your page in proof. Ms. Ward will then print your page as a high resolution PDF for you to proof and edit. You must check for spelling and grammatical errors, spacing issues, picture resolution, etc. The first week of school has come and gone! 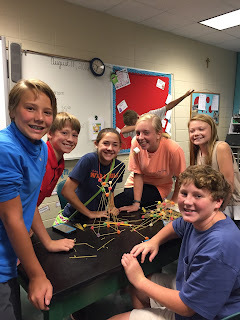 HMS now has a new Yearbook staff that is excited about getting down to business. 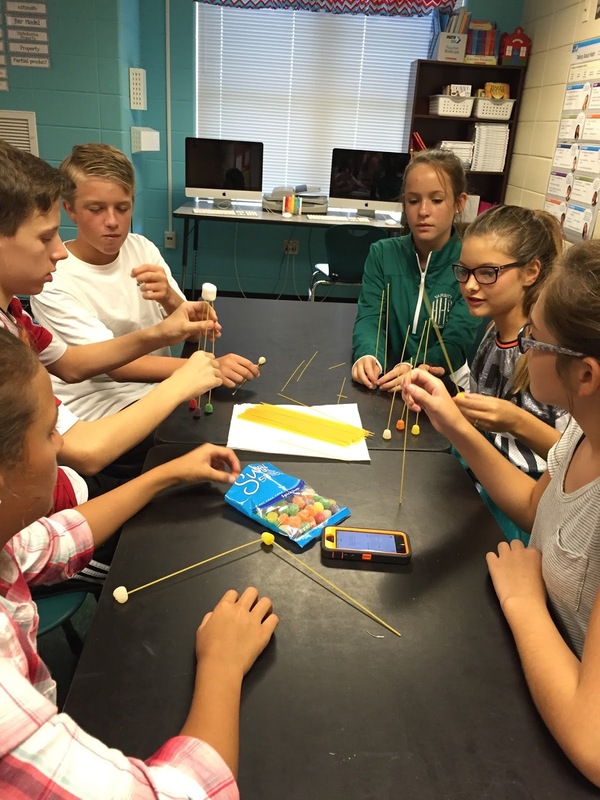 This year's Yearbook Staff is a group of 16 seventh and eighth graders. We have several eighth graders that chose to create our Yearbook again this year. I'm super excited about that. This past year's staff is the first to raise over $1500 in ad sales AND sell EVERY SINGLE yearbook we ordered! We have funds to purchase cameras this year so that students don't have to use their iPhones to take pictures. I think that is fabulous!!! This week, we worked in teams to highlight our strengths. 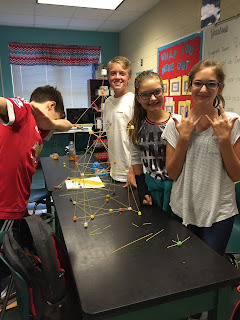 Students were divided into three groups and built spaghetti towers with NO direction from the teacher. The only guidance students were given was that 1) towers must be free-standing, 2) the marshmallow must be on top of the tower, and 3) they could only use the supplies I provided. Each team was provided with 1/2 a box of uncooked spaghetti noodles, 1 jumbo marshmallow, and a bag of gumdrops. Students were given twenty minutes to build their towers. It was so much fun to watch. It was even more fun to listen to them problem solve and reprimand anyone not pulling their weight! 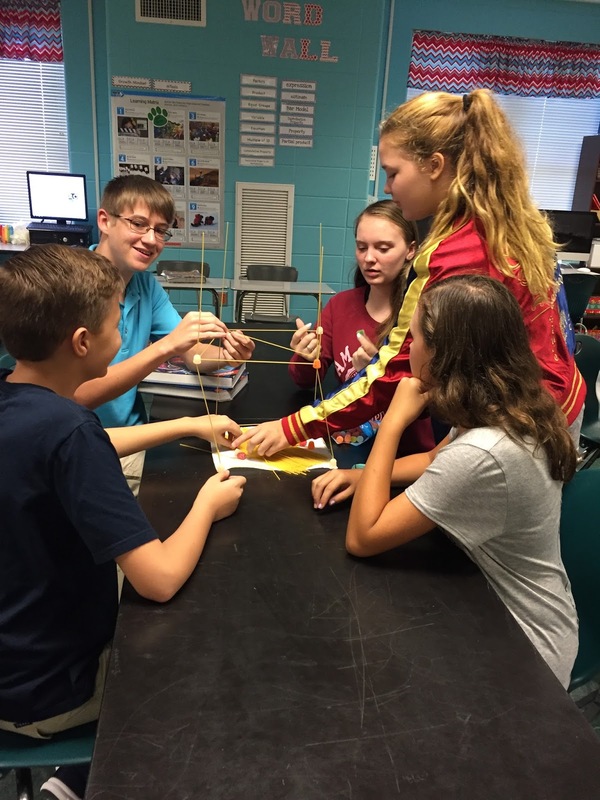 At the end of the activity, students then discussed with their group how the activity went, what they could have done differently, and which students emerged as leaders. They also stuffed their faces with the remaining marshmallows and gumdrops! 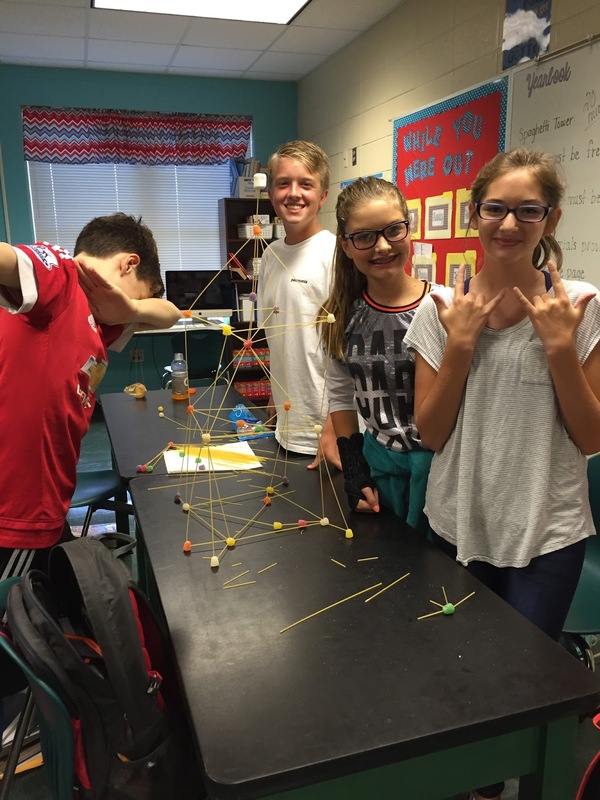 I think the Spaghetti Towers Activity was a thumbs up from our yearbook staff! The AD Sales Assignment was originally due on October 8, 2015. The due date was extended since some of the 8th grade staff members went to the Davis Theater on 10/8/15. Only 5 students turned in this assignment on time (only 1 8th grader that attended the field trip). I realize Google Docs would not load yesterday afternoon; however, the assignment was due yesterday. Every student had the entire week in class to work on envelopes and letters. Many of you chose to work on other assignments or had to finish tests for other classes, stating you would do your letters at home. All students knew I would be working on paperwork all day Friday, so students could come to class to work on their letters during PE or any other time teachers allowed. Only 2 students came to class before 6th period yesterday. The most difficult part of the AD Sales Assignment was actually visiting businesses. Once you had your confirmation sheets, the rest should have been a cake walk. We went over addressing a business envelope correctly. Business envelopes and black pens were provided. We went over using the templates. I provided an example on the Smart Board to make sure everyone knew what to do. If you really LOOK at the templates, you will see that you only had to change a date, put in the correct address, and change the year to 2015-2016. If you turned in your AD Sales Assignment, your grades have been entered. The grade you see in iNow is your final grade for this quarter. Grades must be posted by 8 a.m. on Tuesday, October 20th. I will accept your AD Sales Assignment UNTIL 2 p.m. on Monday, October 19th. Ten points will be deducted from your final grade since the assignment was not turned in on time. I really hate having to take points off, but it is not fair to the 5 students that did turn their work on time if points are not deducted from those of you that did not turn your work in on time. When you come back from Fall Break, page assignments will be in eDesign. Page assignments have DUE dates. DUE DATES are test grades. The yearbook MUST be submitted on time if you want the yearbook back before school gets out. Remember last year? The yearbook didn't come in until Honors' Day for 5th grade! We can't let this happen again. 1. You will have to work on your THANK YOU LETTERS over Fall Break. I absolutely hate that you are having to do that, but... I worked on yearbook last night and I'm up posting on this blog on Saturday morning. That's business, my creative children, AND Yearbook IS a business! 2. Below you can find active links to everything you need to complete this assignment, including the Thank you letter cheat sheet. You were given a copy in class, I posted it to Remind, and it is active below. Make sure you use the correct template for your letter- Ad purchased or Ad NOT purchased. 3. You need to turn in a minimum of 4 confirmation sheets, 4 correctly addressed business envelopes (Do not mail them from home because receipts must be included for purchased ads, I have to sign as sponsor, and Yearbook pays for the stamps. ), and 2 signed copies of each letter (one copy we mail, one copy goes in your folder). 4. Max grade the remaining 15 students can receive for this test grade is a 90/A. A 90 is still an A people. I will take this assignment until 2 p.m. on Monday. I will post grades before I leave campus on Monday, October 19th. The last thing I am going to say regarding this matter is that I would never ask any of you to do anything that I would not ask my own children to do. In fact, both of my children have participated in this activity. I have seen children turned away from businesses. I have seen business owners say no, but I've also seen them say yes. I know how nervous it can be speaking to adults about supporting our yearbook. I believe in my heart that each of you are responsible, capable, creative young men and women. Your letters can be completed in about 20 minutes. You have a week to do it. I will see you and your letters Monday, October 19th. To help you locate the templates for your Thank You letters, I have uploaded the letters here again. Please click the link to download your letters. Use the "cheat sheet" to help you finish this assignment. The Yearbook Ad Sales Fundraiser begins August 17th! This Fundraiser is our major fundraiser to be able to provide additional pages in our yearbook. This assignment counts as a test grade for first nine weeks and is due October 8, 2015. A copy of this information will be sent home on Monday, August 17th. Click below for copies of the project packet. The Thank You Letter templates are posted until October 1, 2014, but I will repost them again later. I think the blog is actually up and running again! Click below for the following information. Your resume and parent signature page are due tomorrow. The AD Sales campaign is coming to a close. Ad Sales must be turned in by Friday, October 3rd for your final test grade for this nine weeks. Please refer to your rubric for the assignment. Everything you need will be posted here.